Democrat Sharon Chung speaks to supporters Tuesday night in Normal. McLean County Democrats celebrate Tuesday night in Normal. Democratic McLean County Board candidate Shayna Watchinski, left, with County Clerk candidate Nikita Richards on Tuesday night. Democrat Logan Smith won election Tuesday night. McLean County Democratic Party chair Erik Rankin rallies the crowd Tuesday night. McLean County Democratic Party chair Erik Rankin hugs County Board candidate Shayna Watchinski on Tuesday night. Democratic challengers knocked off three incumbent Republicans on the McLean County Board on Tuesday, increasing the diversity of an elected body long dominated by white men. With Tuesday’s victories, the Republican majority on the McLean County Board falls to 13-to-7. And the number of women on the board will rise from three to seven. After trailing most of the night, Democrat Elizabeth Johnston led with 53 percent of the vote over Republican incumbent David Selzer in District 5, which includes much of northeast Normal. "I've got a saying on my desk that talks about the man in the arena and how easy it is to throw stones at the man in the arena for people to step up and serve. I am super proud of the 18 years I have served the people of McLean County," Selzer said. Johnston said her fellow women candidates stood out this election for reasons beyond their gender. "We put in the work. We put in the effort, and we connected with voters." Johnston also said she’s proud to have run a candidate-centered campaign. Democrat Sharon Chung led Republican incumbent Ryan Scritchlow by just 80 votes, with all 14 precincts reporting in District 7, which includes parts of central and near-east Bloomington. Chung is believed to be the first Asian-American elected to the McLean County Board. "It's been a fantastic experience," Scritchlow said of his one year on the County Board following his appointment in September 2017. "I met a lot of new people and I've learned a boat load. It's my first election but I've had business losses over the years and things that didn't work out. You can't win if you don't try." Democrat Logan Smith speaks to supporters Tuesday night. And Democrat Logan Smith led Republican incumbent Mark Johnson by over 500 votes in their District 4 contest in northwest Normal. Libertarian Alexandra Engle trailed. Democrat Shayna Watchinski led by a wide margin (67 percent of the vote) over Republican Cheryl Froelich and Libertarian Steve Suess in District 8 (west Bloomington). It’s currently represented by Democrat Paul Segobiano, who lost his March primary to Watchinski. Watchinski said she and other women felt motivated after the 2016 presidential election to join local races. “We were really frightened about what was going to happen to our country, what was going to happen to our rights,” she said. Watchinski said while President Donald Trump’s election may have “lit the match” for some to get involved, “he didn’t sustain us” through the long campaign season. “Looking around and seeing how we can contribute to our communities that we care so deeply about, that sustained us and brought us to where we are now,” she said. In District 9 (south Bloomington), Republican Lyndsay Bloomfield led Democrat David Parker by 325 votes, with Libertarian Sol Roberts-Lieb trailing. Current District 9 board member Erik Rankin, a Democrat, is not seeking re-election, meaning District 9 is a GOP pickup. Meanwhile, Republican incumbents Chuck Erickson (District 10 in east Bloomington), Jim Soeldner (District 2 in southeastern McLean County), and Randy Martin (District 3 in western parts of the county) all appeared headed for re-election. Republican Gerald Thompson won in District 1, taking over for Republican Don Cavallini, who is not seeking re-election. "My opponent (David Siebert) did a good job. He worked hard," Soeldner said. "I think a lot of it was the fact that I'm in a red (Republican) district. I think that made a big difference, so I'm happy to return." Erickson, the former McLean County GOP chairman, lamented the Republican's majority likely being trimmed from 15-to-5 to 13-to-7. 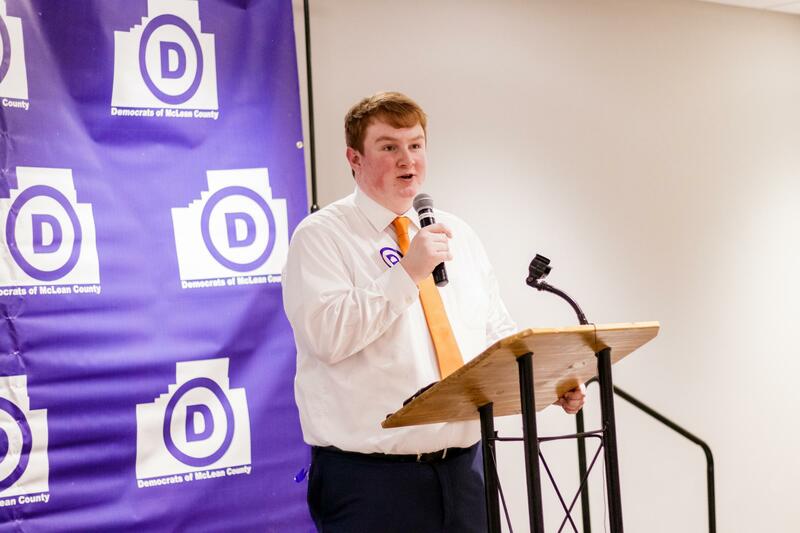 "If we didn't knock on enough doors or if we didn't do enough of the things (the Democrats) did, we need to reassess and make sure we do that next time," Erickson said. The latest election results in several key Illinois races, including governor, U.S. House, and the General Assembly. These results come from NPR and The Associated Press. Track the balance of power between the major parties in Congress as results come in for House and Senate races. These results come from NPR and The Associated Press.